The Cyrious Cloud Connector is a technology that connects your local Cyrious server to Cyrious' cloud (CloudSpace). This technology enables Cyrious to offer a number of Control features and program extensions through the Internet. * It permits Cyrious to deploy new features that could not be supported locally. * It allows Cyrious to take over the IT burden associated with web connectivity. * It lets you keep your data under your control for speed and security. * It combines the best of local and web applications. * The SSLIP and CHAPI services. * The SQL Server Database that Control is using. * The Document Management file system. homegate monitors the connection, and in the event the connection is dropped, automatically attempts to re-establish a connection to the Cyrious CloudSpace. Everything you need to enable the Cyrious Cloud Connector is automatically installed with Control versions 5.7 and higher. However, by default it is not enabled. To take advantage of CloudApps, you will need to enable it in Control. Click on Setup in the top menu and then choose System Setup. You will see a checkbox to enable the Cyrious Cloud Connector. If this is unchecked, click Edit, tick the box, and Save. Note: Your Cloud Root Path will automatically be filled in. This is not a setting that you can manually change in Control; it is a read only field. If you don't have a root path displayed, please contact technical support. || It's that simple! The Cyrious Cloud Connector has been enabled and started. You can check the status of the connection from the homegate web interface. You must be running Control 5.7 or higher. Your local “server” must be running Windows 7 Professional or later. Your SSLIP, CHAPI, and SQL must be on the same computer as homegate. The document management folder must be accessible from the homegate computer (for CloudApps that require document access). You must maintain a current support contract with Cyrious. **Note for Techs:** C^3 Module Authorized must be checked in Internal Authorization UDF. 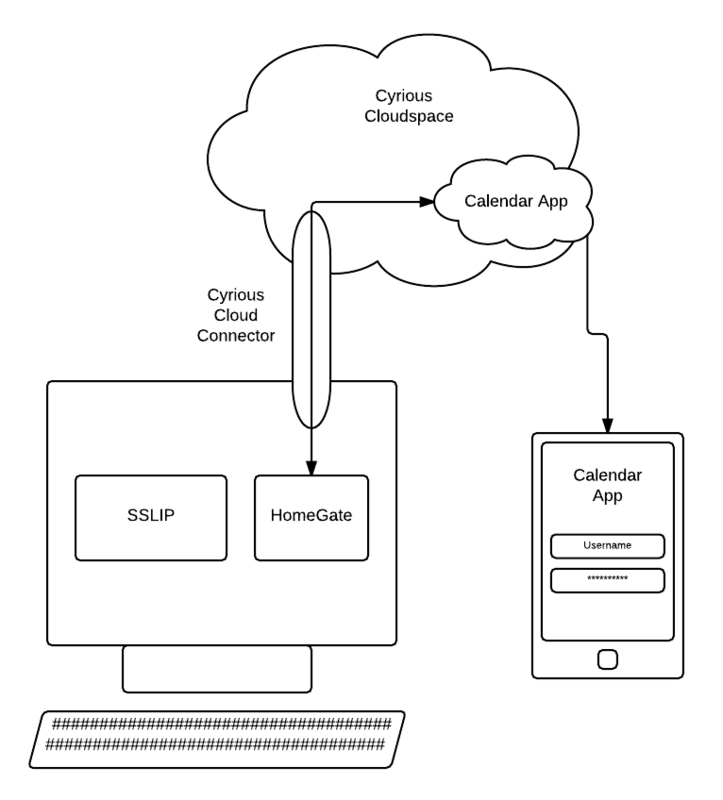 - homegate is the service running on the local SSLIP computer that “dials out” and makes the connection to Cyrious CloudSpace. This service contains a website which can be used to monitor the status of the Cyrious Cloud Connector connection. - This CloudApp provides a web portal for accessing your Control calendars. You dial out - Nothing ever dials in. One of the key aspects of Cyrious' connector is that you do not need to open any inbound firewall ports. All connections are open from your server directly to ours. Usually this means no firewall configuration at all and, as Captain Kirk might have said, you can keep your shields at full power! Public-Private Key Encryption to Ensure Its Really You! 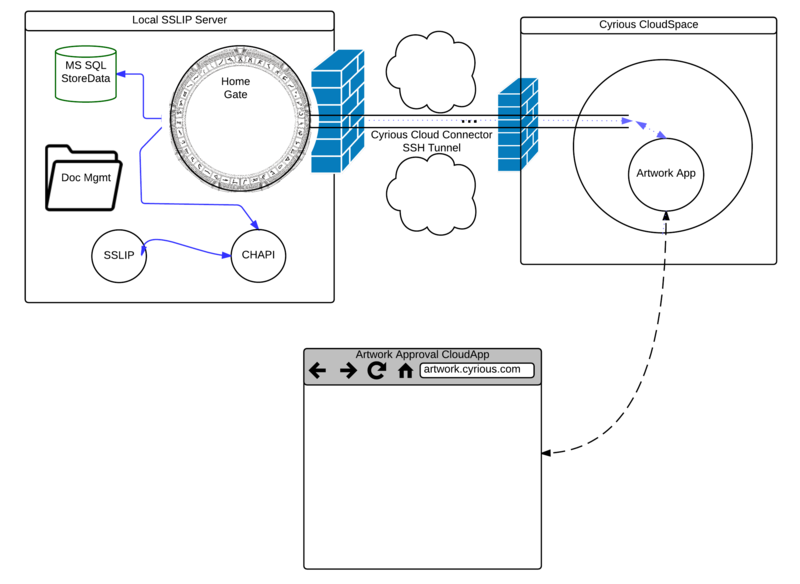 The Cyrious Cloud Connector uses a public-private key pair for the validation. (You have the private key; Cyrious has the public.) If anyone else tries to talk with Cyrious' CloudSpace pretending to be you, the communication will fail without your private key. (Even Cyrious doesn't have your private key.) Likewise, no-one could decrypt any of the communication to you without that key. A Secure SSH Tunnel. The Cyrious Cloud Connector uses the private-public key to establish a secure SSH tunnel using 256-bit encryption. IP Restrictions. Within the Cyrious Cloudspace, only application requests from approved CloudSpace IPs are permitted to talk with your connection. There is more, but hopefully you can rest more assured that Cyrious has security in mind every step along the way.